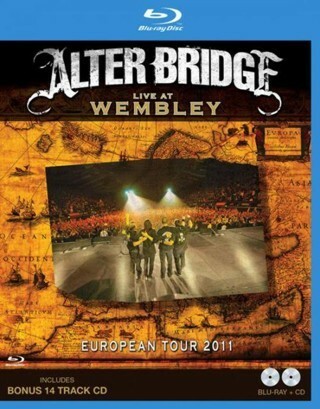 This utterly superb two disc package featuring alternative metal band Alter Bridge is the real deal. Featuring both a live concert cd and a blu ray recording of the Wembley concert from the last UK tour it represents extremely good value for money. The Blu-ray quality is absolutely stunning giving an up close and personal view of the band as they power their way through the material from all three of their studio albums. The live in Amsterdam DVD was truly excellent, but this takes things up another level-although Daniel E Catullo III remains the director- as it now features material from the band’s latest album ‘AB 111’. The band rattle through the whole back catalogue including songs like ‘Metalingus’ from the debut, ‘Ties That Bind’ from ‘Blackbird’ and a host of new material from the third album including show opener ‘Slip To The Void’. Surprisingly in their native America the band remains something of misnomer – strange when you realize that the band is essentially made up of three quarters of 90’s megastars Creed - whilst in the UK their popularity has been steadily on the increase through touring and promotion from their record label Roadrunner. Clearly the band is at the top of their game and vocalist Myles Kennedy shows here what a superb voice he has, whilst guitarist Mark Tremonti can clearly shred with the best of them. If you’re a die-hard fan of the band then this will be on your shopping list, but for the casual fan that perhaps doesn’t get out to see the band live as often as they would like this is the ideal package: it brings the band to you and you can play it whenever you want. You can even pause it to go and make a cup of tea, something that you definitely can’t do at Wembley Arena!